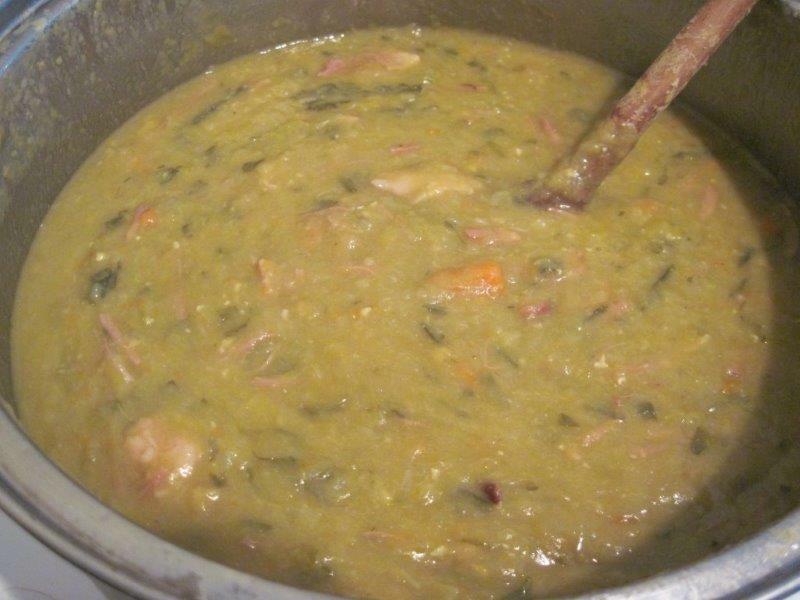 This split pea and ham soup is one of the best winter dishes as it’s thick, hearty, warming and nourishing – almost more like a stew than a soup. The original recipe was given to me several years ago by my friend Belinda (thanks B!) and it’s apparently an old Dutch family recipe. For me it comes with memories of many episodes of Prison Break, which a bunch of us watched at one sitting while eating Belinda’s delicious soup. We all agreed that the soup and certain cast members of Prison Break were equally yummy! I have in fact halved most of the original quantities as I simply don’t have a big enough pot otherwise. Even the half quantities (which I have given here) still make a lot of soup so the left-overs can be eaten the next day or frozen to be reheated at another time. I still use the whole eisbein though so this version is more meaty than the original. Eaten with some crusty bread, it is literally a meal in itself. This last time I made it, I only had a few small, oldish carrots in the fridge so just used those and it was fine, although I think it’s better with 3 largish ones. When preparing the leeks, cut off the roots and peel back the first few layers of leaves as you wash them to make sure you have removed all the dirt. I love adding the celery tops later in the process as they add extra greens to the soup. You can also add a spicy sausage or two if you like, although with the extra meat from the eisbein, it’s not really necessary and I usually don’t. As you are using stock, don’t add any extra salt at the beginning – you can add when you serve if need be. In the absence of home-made beef stock, any other beef stock works although I quite like a combo of Knorr stock pots and Ina Paarman’s stock powder. And finally, because this soup cooks for so long, there is a good chance that you will end up with a layer of burnt bits at the bottom of the pot after a few hours, no matter how well you stir as you go. I recommend just leaving it there rather than trying to scrape it up as you stir or you will end up with burnt bits in your soup. 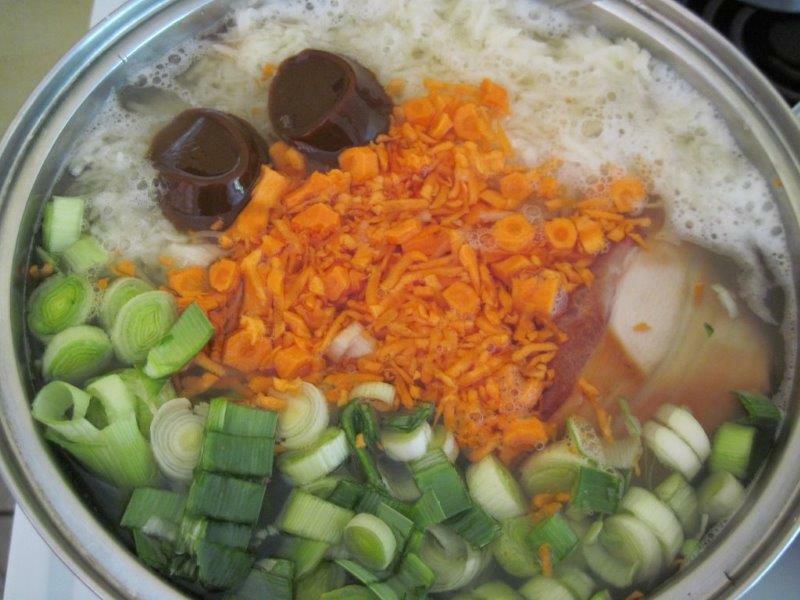 Once you’ve eaten/decanted all the soup, if you soak the pot for a while, the burnt layer comes off easily, almost in one piece, and can be thrown away, then you can properly wash the pot. 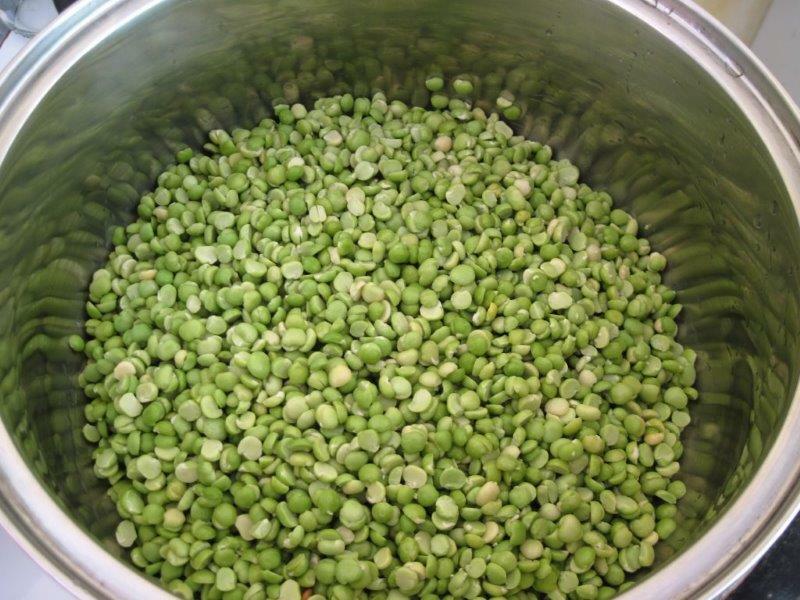 Soak the split peas overnight by placing them in a big bowl and filling the bowl with water. In the morning you will find that the peas have absorbed a lot of the water and swelled up. Pour them through a sieve to get rid of any excess water, then run the tap over the peas for a few seconds to get rid of any extra starch. Pour the peas into a big pot. Briefly rinse the eisbein under the tap and prepare all your veg. 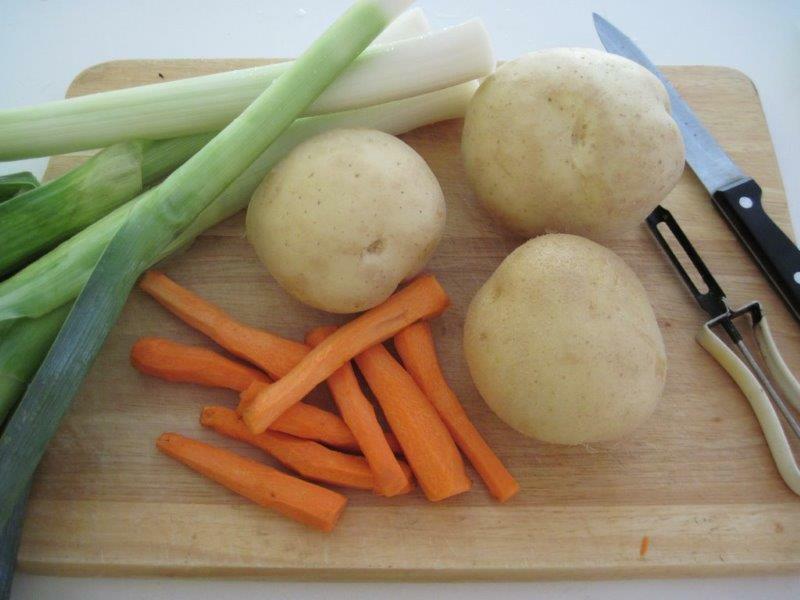 Wash and slice the leeks, and peel and grate the potatoes and carrots. 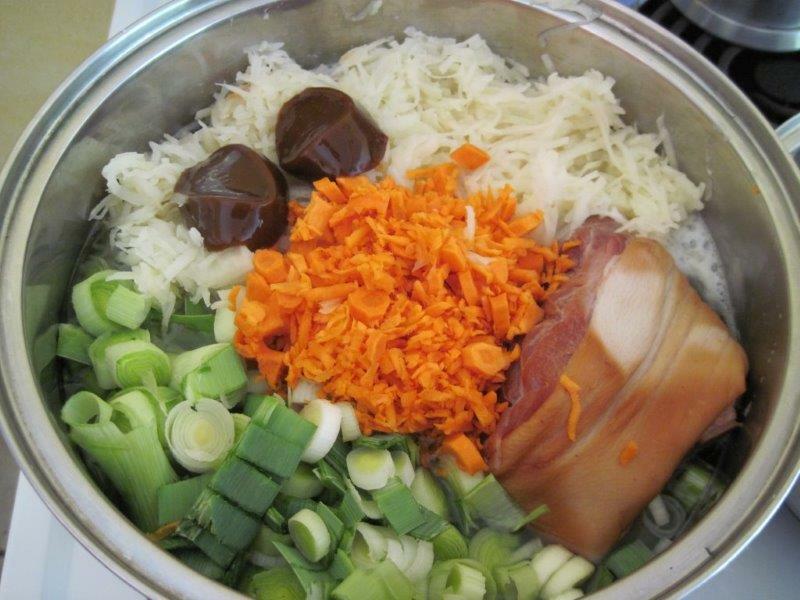 Place the eisbein and veg into the pot with the peas and add the stock. Cover it all with cold water and bring to the boil. Then turn down the heat until it is just simmering, and simmer for 2½ – 3 hours, stirring every half hour or so. There will probably be some burnt bits that stick to the bottom so stir gently down to the bottom of the pot, but don’t try to dislodge the burnt bits or you will end up with them in your soup. After that time, the peas should be fairly mushy and the meat should be falling off the bone. Remove the eisbein and cut up the meat (it kind of shreds), getting rid of the skin, bone and any excess fatty bits. Put the cut-up meat back in the pot along with the celery leaves and spicy sausage, if you are using them. Let it all simmer another hour or so. Serve hot with some yoghurt, parsley, a drizzle of olive oil and/or salt and pepper to taste. Note: This soup is even better the day after you make it, and it freezes and reheats very well. You may just need to add some water if it is thicker than you like.